Equi-Vital Essentials – All you need to know! Serena Paleka from S A says “My Riding Pony/TB Oliver’s diet was changed over to his VF natural diet in July 2016 which includes the supplement Equi-Vital as part of his daily feed. Oliver loves his new diet, he has a glowing coat, great muscle tone, balanced energy and is happier and healthier than he has ever been. Equi-Vital is a no fuss easy to feed supplement, Oliver would eat it straight out of the packet if I let him. 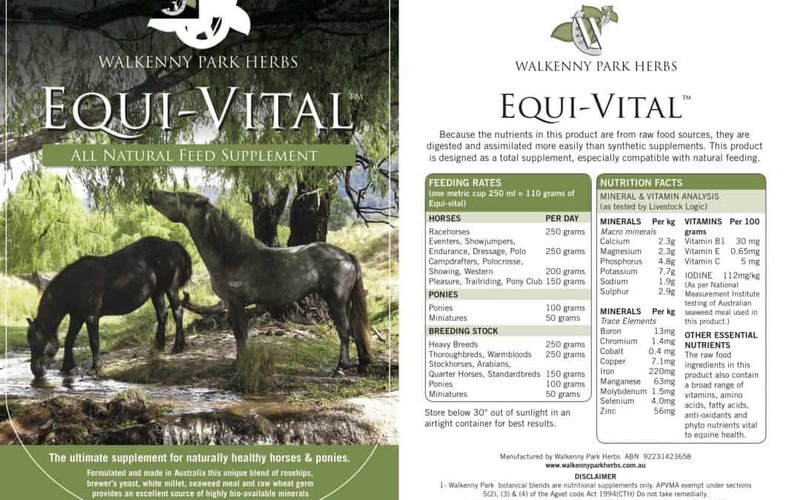 I would highly recommend Equi-Vital if you are looking for an all natural supplement for your horse. 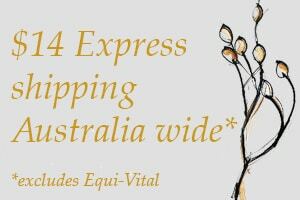 Formulated by Equine Herbalists Victoria Ferguson and Denise Farrugia, Equi-Vital is bursting with essential nutrients. Raw Wheat Germ, straight from the mill, freshly crushed French White Millet, Rosehips granules, food grade Brewer’s Yeast and Australian Seaweed provide an abundant source of nutrients essential to equine health. It saves time because you only add one item to the feed, instead of five! When adding items separately there is a tendency to put either too little or too much of each ingredient, thereby wasting money and compromising effectiveness. The ratio of ingredients and feeding rates are finely tuned in the Equi-Vital formula. When buying separate ingredients you need to buy in bulk and have to pay freight on most of them. And often one runs out before another does, then sometimes it is just left out altogether. You don’t have to crush your own millet and you don’t have to search for raw wheat germ. Your initial overall outlay could be more than buying a 15 kg bucket of Equi-Vital! Iodine occurring as amino acids, most essential amino acids and Vitamin B12 (which is not in Brewer’s Yeast). Equi-Vital has been independently tested by Livestock Logic, and provides an excellent balance of minerals, trace elements and vitamins. Minerals, vitamins, amino acids, anti-oxidants, essential fatty acids and phyto-nutrients are highly bio-available to horses from this unique raw food product.